When you toss enough words around in print, sooner or later you start making up some of your own. In 2009, the one that I felt needed to get right out in the open was “despermating”. 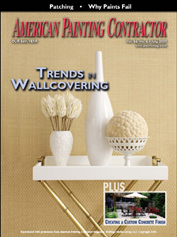 This seemed to resonate with paint contractors around the country, as I received more feedback from this article than perhaps anything I have ever written. To read the full article: CLICK HERE! nice post and article, thank you. A friend and remodeling professional, Paul Eldrenkamp, refers to ‘fear-based estimating’ in his community. A similar response to trying economic conditions, wherein the contractor calculates a cost of work then assumes the customer will never pay the price so immediately lops 10%-%20% off the top to make the bid more attractive….a great way to go out of business. As long as the market indulges the contractor willing to skirt the legal inconveniences of insurance, payroll tax and living wages, the low balling, trunk slamming, station wagon bandit will always have a place at the bottom of our collective food chain. You correctly bullet a list of challenges to pose to the customer that helps seperate the wheat from the chaff. One of the ways any contractor can set themselves apart from the peasantry is simply through professional presentation – clean whites, company shirts and outerwear, tidy employees driving clean and well maintained vans, and lastly, good manners. All of this starts at the top of course. As owners and employees we set the tone and we determine our company culture; swear in front of your people and expect them to swear in front of your customers; show up hung over and unshaven, expect the same, etc. What has impressed me the most when spending time with my PDCA and Advisors On Target peers is their alignment with my own values and culture. Add the benefits of their typical thoughtfulness and humility, and you have a common theme that speaks volumes for our professional association. Keep up your prodigious and excellent output – I always enjoy your reflections. Thank you for stopping by. That right there is a comment that is worthy of guest post status. Perhaps we should discuss that in the future. Agree completely.